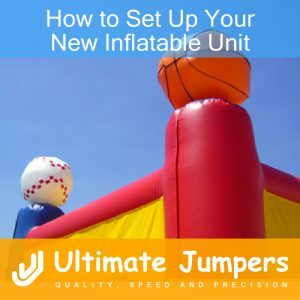 Now that you have made your purchase from Ultimate Jumpers, Inc., let’s look at how to set up your new inflatable unit. 3. Unfold the inflatable on the tarp, paying attention to where the entrance/exit should be. 4. Next, check to make sure that all the zippers are closed, otherwise the unit will not properly inflate. 5. Plug the blower in to the electrical outlet then turn the switch to the “on” position. The inflatable should be completely aired up within just a few minutes. 6. For regular jumpers and combo units – tie downs are located on the side of the units near the bottom. Either secure the unit with the provided spikes (for grass) or sandbags (concrete/indoors). 7. For slides and water slides, the tie downs are located on the side of the unit towards the middle. Then, follow the same spike/sandbag instructions from step 6. 8. Water slides are used with constant water running down the slide using misters also known as a soaker hose. You can hook up the soaker hose to a regular garden hose and then run it across the top (for units that have a pool at the bottom, make sure you fill up the pool first before you connect the hoses to each other). 9. Make sure that all attendees and supervising staff are aware of the warning sign(s) that are on any inflatable. In addition, provide a phone number so you can be contacted should any problems arise. If there are any questions regarding how to set up your new inflatable unit, call us for assistance at 1-800-219-9211.